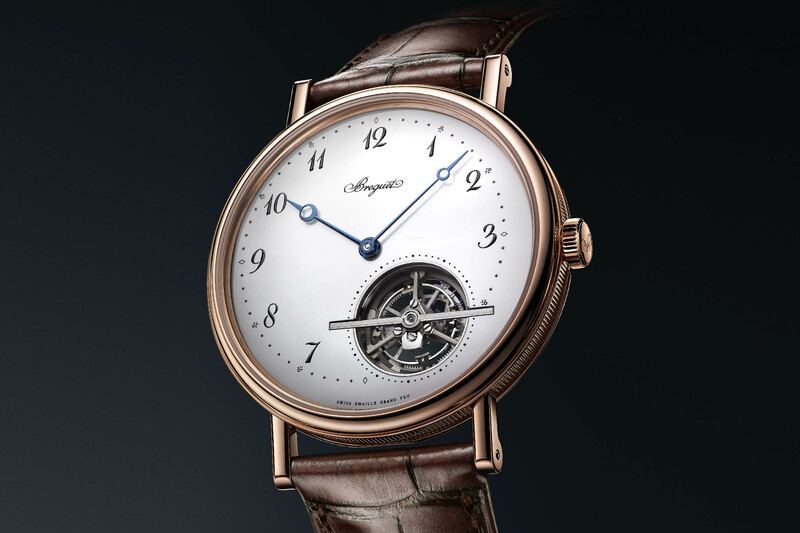 Breguet is alive and kicking, incarnated in this perpetual calendar tourbillon 3797 brimming with historical references and his unique style. 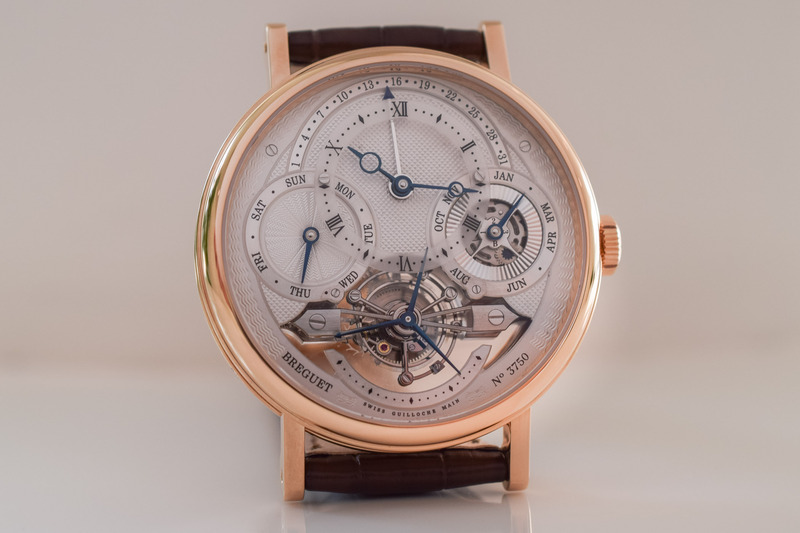 A compendium of Abraham-Louis Breguet’s ingenious inventions and style, the Classique Complications 3797 is a magnificent perpetual calendar tourbillon laden with nostalgia for the undisputed horological star of the 18th century. 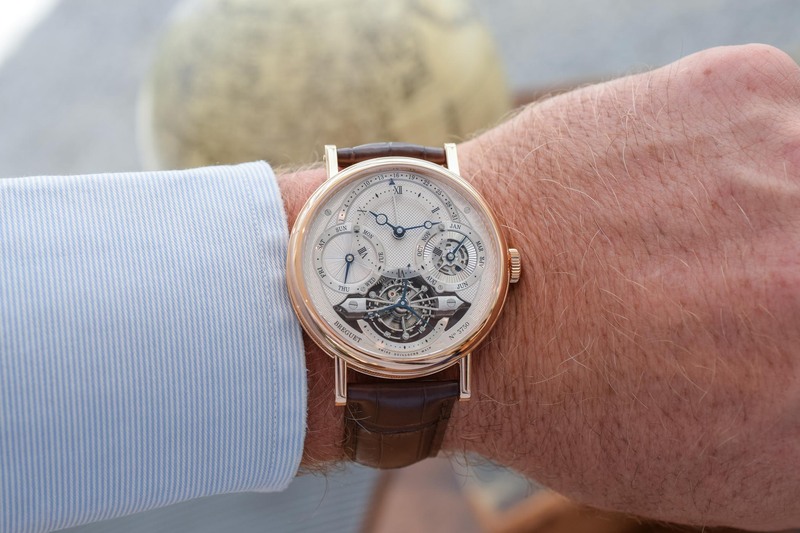 Released in 2014, the 3797 is Breguet in his purest, unadulterated form with all the ‘unmistakable signs’ of the creator and a couple of 21st-century tweaks that the maestro would surely relish. Although almost all the heavyweights of the watch scene have produced a perpetual calendar tourbillon combination – ALS Lange 1, IWC Portugieser, Patek, Chopard et al. – none of them can match the historical clout and legitimacy of Breguet in this department. The 41mm case of the 3797, in rose gold or platinum, is a time capsule transporting the wearer (or in this case, the admirer) on a historical journey back in time. Every detail of the 3797 shouts Breguet: from the engine-turned dial to the Breguet overcoil below deck, from the tourbillon escapement to the retrograde calendar mechanism, all the way down to the secret signature that Breguet invented to deter counterfeits. Everything harks back to the man who is rightfully considered one of the greatest luminaries of his day. The term ‘watchmaker’ seems far too limiting in this context. Abraham-Louis Breguet was an inventor, an engineer, a physicist, a mathematician, a metallurgist, a craftsman, an artist and a maverick entrepreneur all rolled into one. Although Breguet did not invent the perpetual calendar – that honour belongs to Thomas Mudge – he was fascinated by this complication and developed a curious hybrid version that featured both a Gregorian and Republican calendar. Known as watch No. 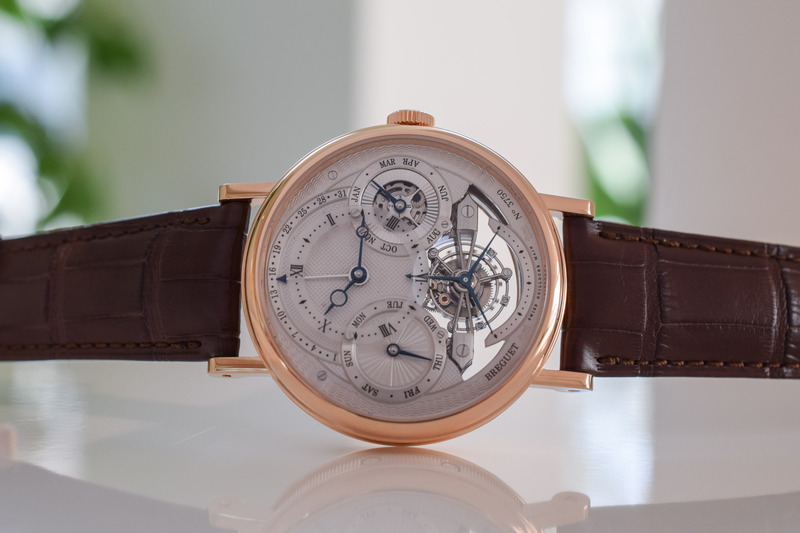 45, Breguet’s conciliatory perpetual calendar took into account the traditional Gregorian calendar and the more revolutionary Republican Calendar that declared 1792 (Proclamation of the Republic) as Year One and changed the names of the months and days of the week to eliminate any reference to religious or royalist influences. A few years later, on 7 Messidor Year IX in the Republican calendar, or 26 June 1801, Breguet obtained a 10-year patent for his new type of regulator called the tourbillon. 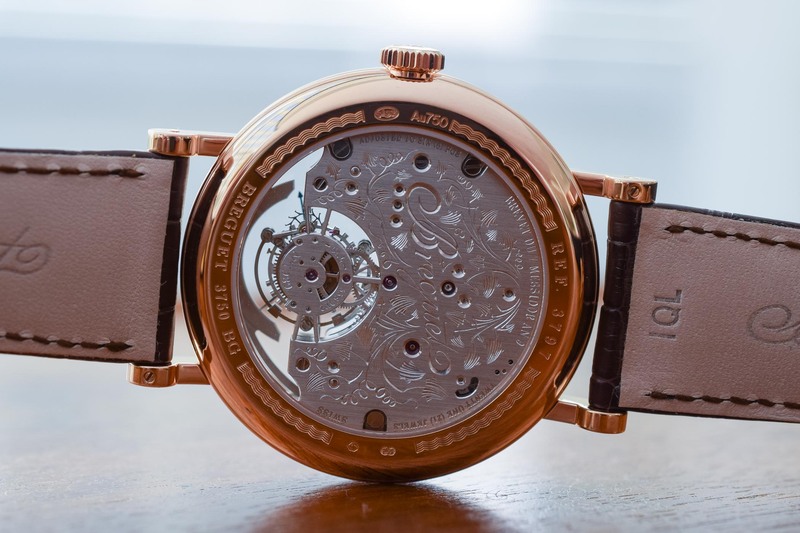 His breakthrough invention, designed to counteract the negative forces of gravity on the movement by mounting the entire escapement inside a mobile carriage improved the precision of pocket watches. 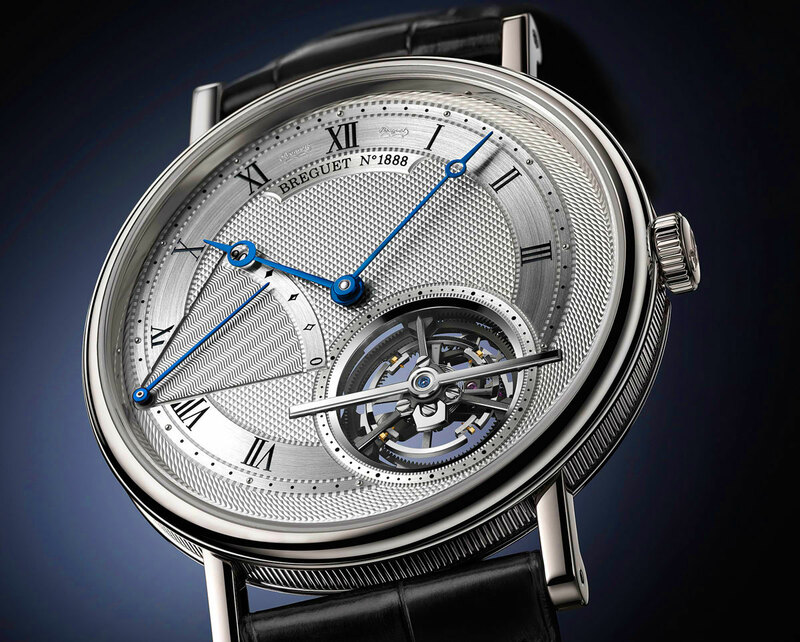 You can read all about Breguet’s breakthrough tourbillon invention here. As you would expect, the large one-minute tourbillon of the 3797 occupies a commanding position on the dial and is held in place by a skeletonised bridge for optimum viewing pleasure (even the three-pronged hands of the small seconds are needle-thin). Moving up from the mesmerising revolutions of the tourbillon, the dial is taken over by the perpetual calendar indications, which, despite the copious amount of information and Baroque aesthetics, are surprisingly intuitive to read. The largest sub-dial displays the hours and minutes and is surmounted by an elegant arch with a retrograde display of the date, a complication Breguet himself developed in 1794. Two intersecting and smaller counters at 3 and 9 o’clock relay the months and leap year and the days of the week. 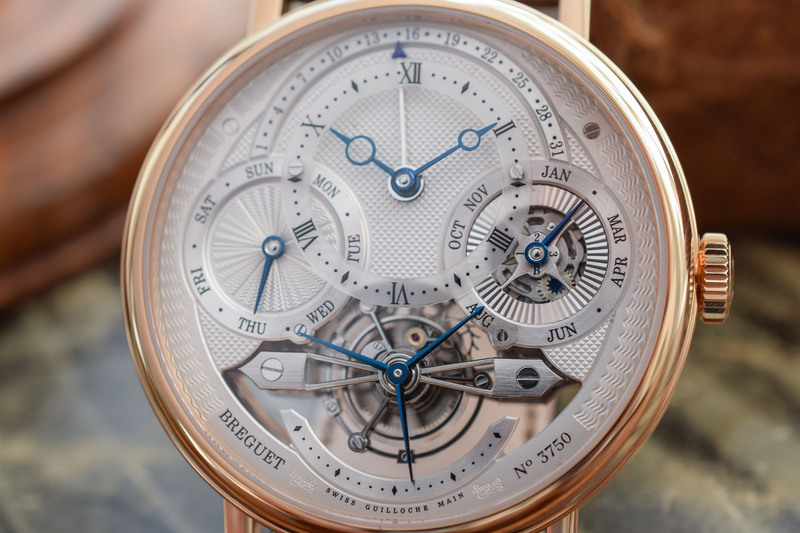 That’s a lot of information in one small space but Breguet (the brand) has come up with an ingenious solution to lighten the load. The hour and minutes chapter ring is suspended above the dial and made from transparent sapphire crystal. The opaque ring features Roman numerals and is read with hallmark Breguet open-tipped hands in blued steel, something Abraham-Louis Breguet first introduced on his dials back in 1783. What is really fascinating though is the way that all the supplementary hands (save the hour and minute hands) glide underneath the floating sapphire ring. 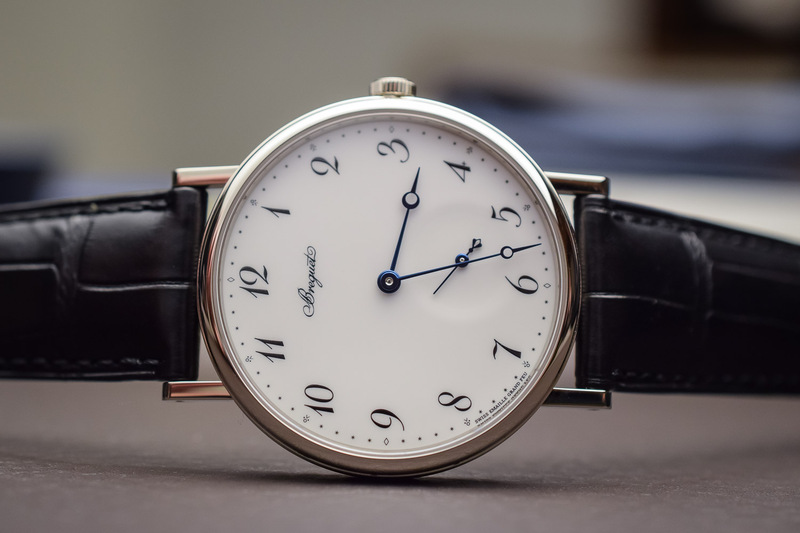 In the name of legibility, the leap year indicator is discreetly tucked inside the month ring -a wise choice given that the leap year is not something you consult on a daily basis. The 3797 would not be complete without another signature Breguet element: the engine-turned or hand-guilloché dial. 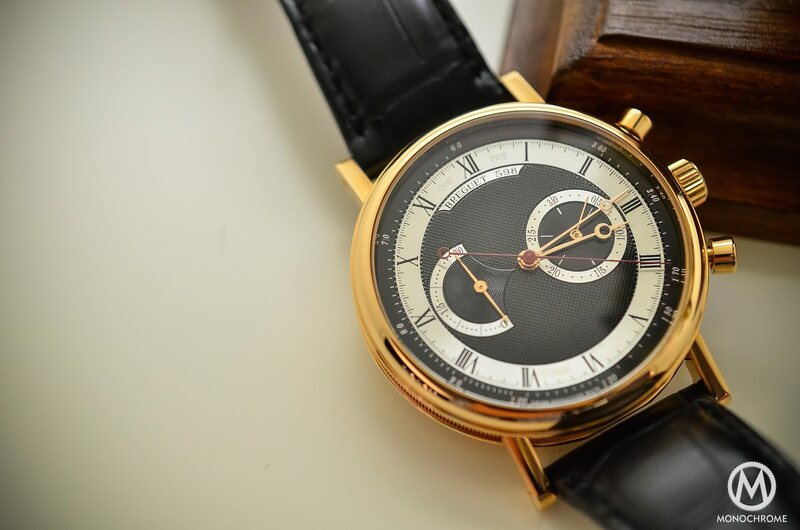 Although Breguet did not invent the art of guillochage, he was the first to introduce it in watchmaking. From 1786, Breguet used guilloché for decorative and practical purposes thanks to its ability to suppress the reflection of light on the metal dial and delineate different functions. In this case, the 18k gold dial plate has been silvered and decorated with four different styles of guilloché: a hobnail pattern behind the hours, a sunburst pattern on the months counter with a blue sun for the leap years, chevrons on the days of the week counter and a wavy pattern on the outer perimeter of the dial. For a first-hand account of how Breguet maintains this tradition alive today, read Xavier’s fascinating article here. 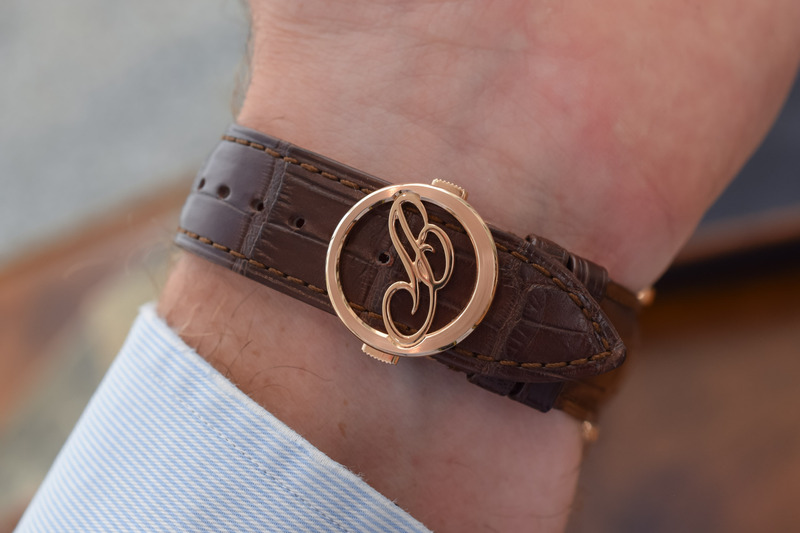 Turning over the 41mm case, with its signature fluted caseband and welded lugs, reveals an ornately decorated baseplate. 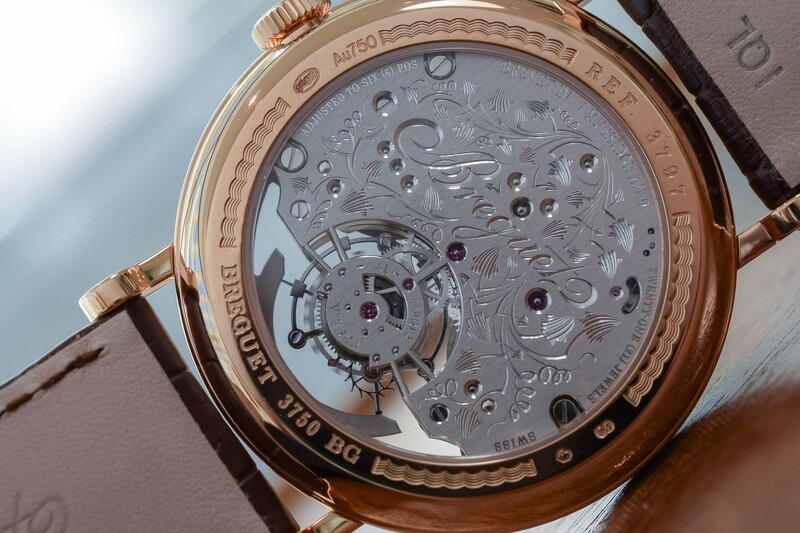 Entirely engraved by hand with a flowing trellis decoration, a large arched cut-out provides light for the tourbillon (note the engraving on the baseplate that reads ‘Brevet du 7 Messidor An 9’). The manual-winding movement, Breguet Calibre 558QP12, beats at a traditional speed of 2,5Hz (or 18,000vph) allowing you to appreciate the revolutions. 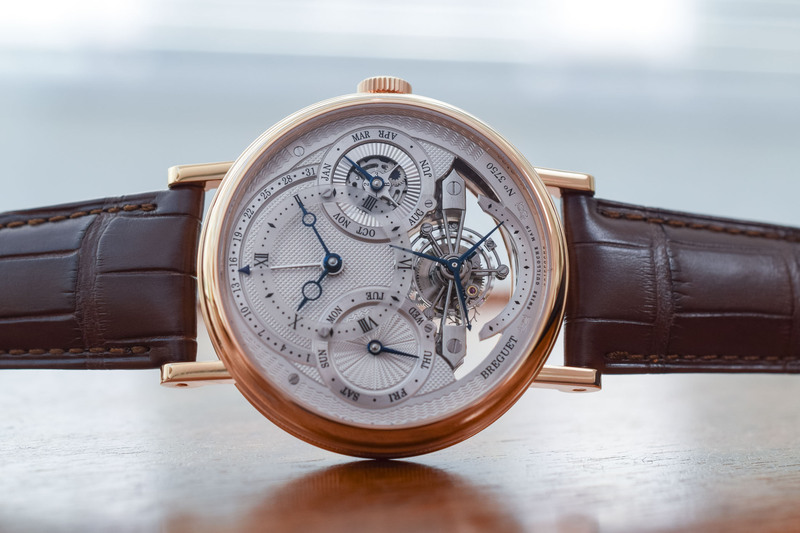 With a power reserve of 50 hours, the movement also features another landmark Breguet invention: the 1795 Breguet overcoil or Breguet balance spring. Like the conductor of an orchestra who sets the rhythm of a musical score, the balance spring is key to a watch’s performance. Again, Breguet did not invent the balance spring, that was the work of Dutch mathematician Huygens, but he did improve it. By raising the last coil in the spring and reducing its curvature, Breguet ensured that the balance spring adopts a concentric form. This meant increased precision and less erosion on the balance staff. He also added a bimetallic compensation bar to cancel out the effects of temperature. There can be no mistake about the provenance of the 3797. This is pure Breguet in its most unadulterated form. 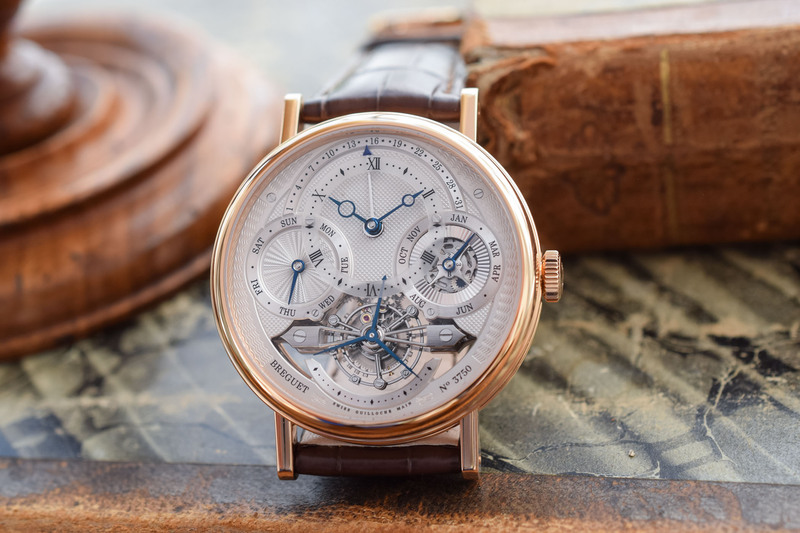 Packed with historical references, the execution might be a little on the ornate/Baroque side for some, but for devotees of Breguet (the man) and Breguet (the brand), this is a rare treat indeed. 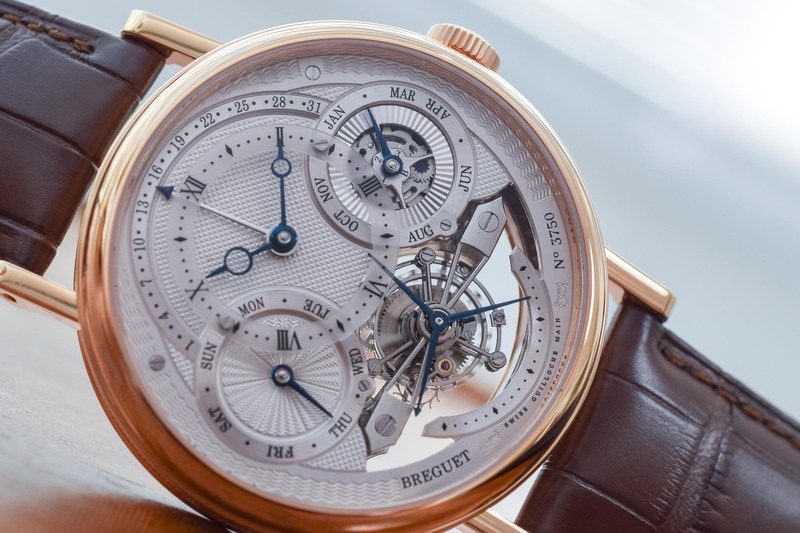 The 18k pink gold version of the Breguet Classique Complications 3797 Perpetual Calendar Tourbillon, presented on a brown leather strap with a triple blade folding clasp, retails for EUR 160,000 (incl. VAT) while the platinum edition on a black leather strap retails for EUR 175,000 (incl. VAT). 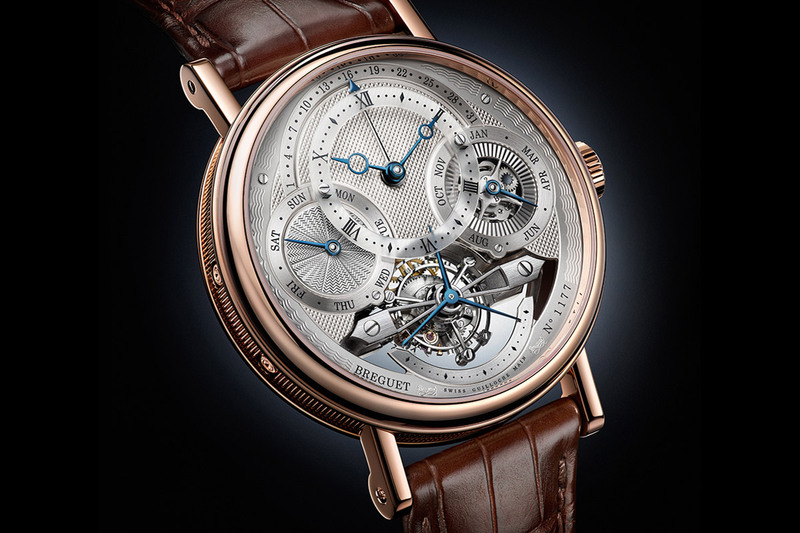 For more information, please consult www.breguet.com. Mon dieu. We can but dream. Apropos of your mention of ‘the rhythm of a musical score’ I’d recently been admiring their 7800 La Musicale that plays Bach or Rossini. Amazing. I don’t find reading this watch surprisingly intuitive. 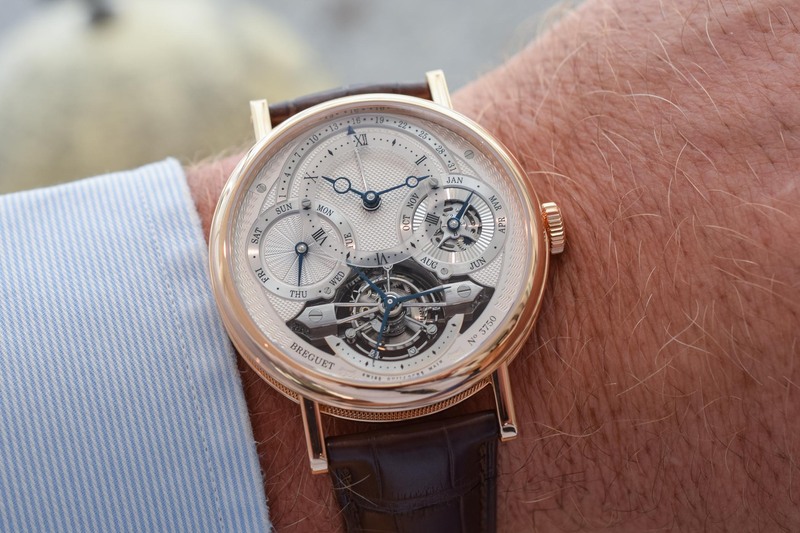 But I don’t really care either as its such an amazingly beautiful work of high horology. I wish I could see the minute counter turn….I bet its mesmerizing. Way too baroque in rose gold, I will take mine in platinum if you please. Rarified horology indeed, I’d be satisfied with a Brequet Classique 7147 —easier to read.